I was super inspired by Jillian Harris’s adorable yellow nursery for her son Leo. So I curated this collection of sweet Safari Animal goodies. From newborn to toddler, you’re sure to find something for that special little one in this week’s collection. By now, you’ve probably caught on to the baby shark craze and whether you’re a fan of song or the video (or both!) 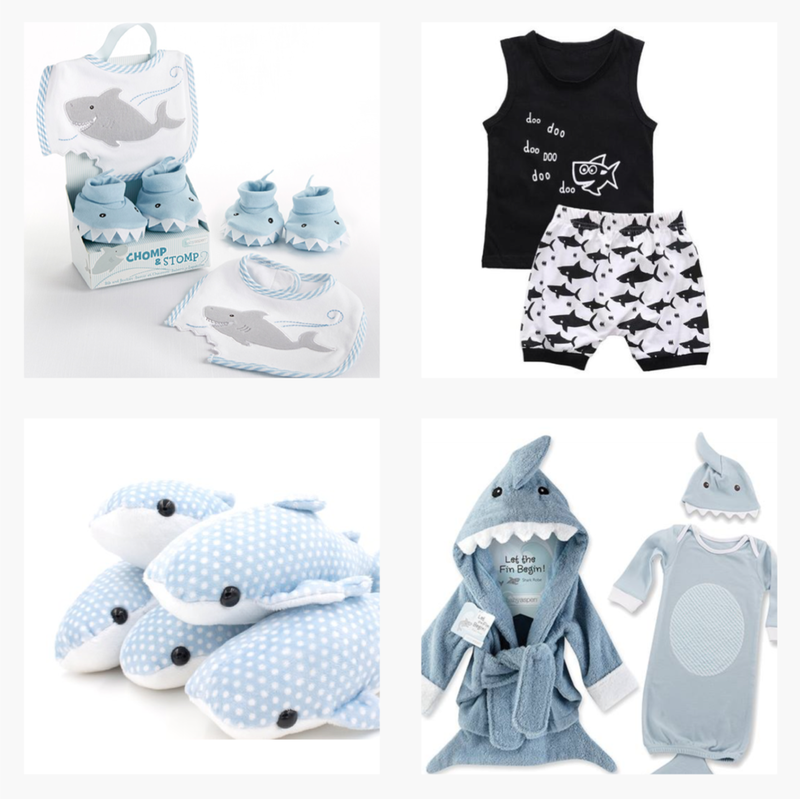 you might have a little one asking for all things shark related. But if you’re like me, you might not want lots of bright and noisy toys laying around only to be discarded as soon as the next viral sing along song comes out. 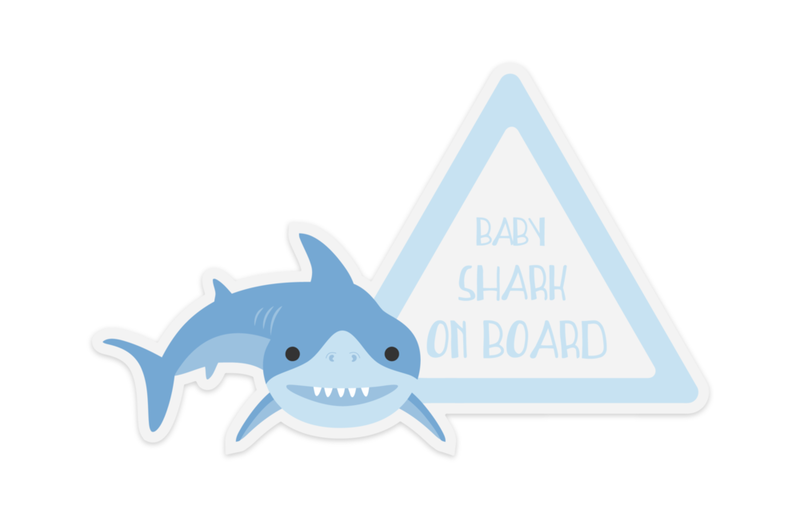 So I’ve gathered this list of adorable, tasteful, and most importantly practical baby shark gifts for kiddos! This adorable robe and onesie set couldn’t be a better combination of cute and practical. 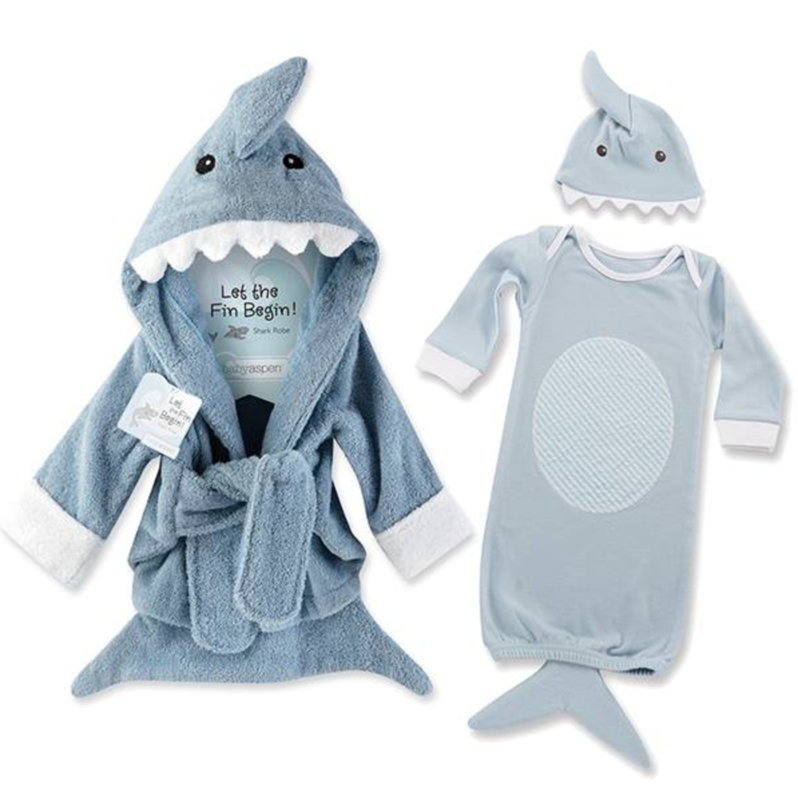 After you give your toddler a bath, wrap them up in this adorable robe and let them walk around pretending to be their favorite new sea creature! This set is sold by Corner Stork Baby Gifts. This adorable little guy is the perfect way to delight your toddler every time they hop into the car. It’s waterproof, durable, and best of all features your favorite new friend. You can find these stickers (and many more) on my shop at GoodnightFox on Etsy. Of course your kiddos are going to want to chomp down on some delicious shark bait.. So you have to be prepared with some gear to get them ready. Check out these adorable Bib & Shoes sets by Baby Aspen and they’ll be ready to nom nom nom through whatever you throw their way! And of course, your toddler won’t be able to survive without some kind of baby shark attire. And I personally love this black and white shark pattern. It’s clean and modern but still fun and friendly for kids. So you can still take them out and not be embarrassed to be decked out in baby shark gear! You can find this adorable set at Beary Kids Baby Boutique. You probably won’t be able to put them to bed without a cute little shark to cuddle up to. So if you’re really up for a challenge, make it a fun bonding activity and grab this adorable sewing pattern from BeeZeeArt on Etsy. There you have it! Five very tasteful ways you can surprise and delight you favorite shark-loving toddler. And if you’re looking for the inspiration that started it all, you can check out the Baby Shark Video here! If you live in a snowy climate or you just can’t help but love baby blues and whites, you’re going to love this arctic inspired nursery collection. From decor to games, this collection is sure to inspire the perfect nursery for your little one. So there you have it! 8 amazing products & inspiration by some of my favorite small businesses and entrepreneurs. Check out their websites or follow their instagram handles for more great baby and nursery inspiration! There’s nothing sweeter than a nursery designed around your favorite nursery rhymes and lullabies! My mom used to always sing “You are my sunshine, my only sunshine…” to me before bed and it inspired me to create this bright and sunny collection of nursery room decor items. 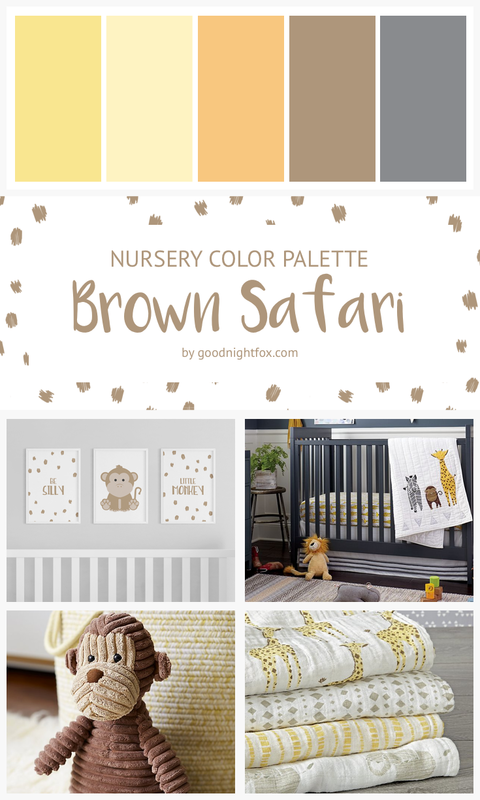 This yellow and gray palette is perfect for a gender neutral nursery. And with such a neutral base, you can easily swap out inexpensive decor items when you want to change the palette or as your kid grows up. To get this modern nursery vibe, start with neutral bases for your furniture sets. I personally love this white crib from Crate & Barrel Kids. It’s ultra modern and sleek, but provides enough white paneling to bounce lots of light around the room and fill the space with sunshine. The Milo glider and swivel chair in gray is the perfect base for this sleek look (and it doesn’t hurt that it happens to be named after my dog!). And if you’re looking for great cribs for twins, check out mamawonder.com. The fun part of this room is the sunny yellow pops of color! Now, I say pops of color because you definitely don’t want to go over board. And it’s so easy to do when you’re walking around the store because the options are endless! But yellow is actually a very hard color to match so in order to ensure you’re in the right color family, carry a swatch around with you when you shop. Yellows can range from golden rod (more orange) to sunshine (more bright and white) to butter cream (light and white, almost pastel). So once you find the look you’re going for, stick to it. I recommend sunshine yellow for this particular look. And to help you out, I’ve curated some of my favorite accent pieces here. When used sparingly, I a nice big pop of yellow can work quite well. Limit yourself to one big pop for the entire room because your small accents will tie everything else together. I personally love this yellow braided pouf. Not only does it add a nice pop of sunshine yellow, but it also brings a lovely texture to the room which will draw the eye and add visual interest. 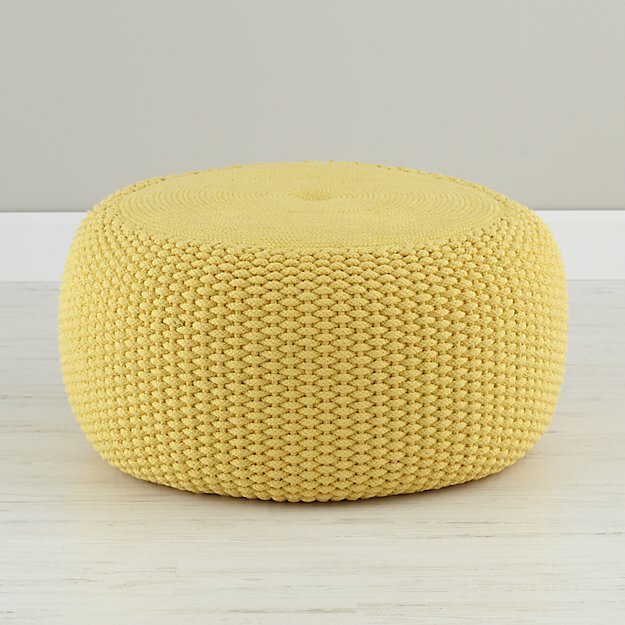 If you’re not quite ready for a pouf, then your next best bet is a super simple yellow throw. Tossed over the back of your rocking chair, the yellow throw is a simple addition that can really bring the room together. Again, finding one with a great texture like this triangle knit baby blanket from Pottery Barn Kids will really add some nice sunshine to the room. If you don’t already have your bookshelves planned out, then this yellow giraffe bookshelf will totally knock your socks off. Not only is it just super adorable, but it’s very functional and at a height your kids can reach as they grow up and want to choose bedtime stories for themselves. Okay, so now that you’ve nailed the big ticket items, it’s time to decorate with small accents. Remember, the majority of the room should be grey and white, so don’t get carried away with accents. But choose the ones that are most special or meaningful to you. I have a few of my personal favorites here to help you out. If you love the You Are My Sunshine theme like I do, then you’ll definitely want to grab a sun and clouds baby mobile. I love shopping small businesses and I found this beautiful hand-crafted sunshine mobile on Etsy. Alternatively, if you don’t want to go overboard on the sunshine, you can also accent with hand-painted wooden letters to spell out your child’s name. You can either hang these on the wall as a sign, or they look great just sitting on a bookshelf. Or you can simply purchase your baby’s initials and use them as bookends between children books. Using the baby’s name is a great way to personalize the room, but if you haven’t picked out a name just yet, you can also accent with a brightly colored stuffed animal. There are lots of options for suns and clouds, but I personally love the texture of the corduroy Jellycat lion. Now you have lots of options for decorating your walls with art! If you’re feeling adventurous and down for DIY, then I absolutely love the look of large chevron patterns painted in white on gray walls. It’s such a classic look and work great for a simple accent wall. If you’re not sure you want to commit to that, then check out these adorable new prints that I recently added to the GoodnightFox collection. This You Are My Sunshine series comes in sets of 3, 4, and 6 prints and can be done in various sizes. You can also add a custom print with your child’s name to add that little touch of personalization. If you’re feeling extra adventurous, you can also try incorporating orange accents throughout. But remember not to go overboard! A few small pops of color go a long way toward pulling the room together while still achieving the modern and sleek gray and white nursery look. So here you have the full shopping list for everything mentioned above! This nursery is sure to leave you feeling sunny and bright. If you're searching for a classy look for your new baby boy's bedroom, you simply can't go wrong with Brown & Navy. The clean white and grey base balanced with navy is such a sophisticated look. And when paired with the nice gentle textures of a brown teddy bear, it makes the perfect soft look to bring home baby boy. Plus, you can find most of this collection at Crate&Kids! Pair it with a beautiful custom print with your little boy's name and a powerful motivational saying and you've got a great little space for his dreams to thrive! OMG! So I just found out that Burt's Bees makes baby clothes and they are just so adorable! So I decided to pull together this cute set of bumble bee baby gear. 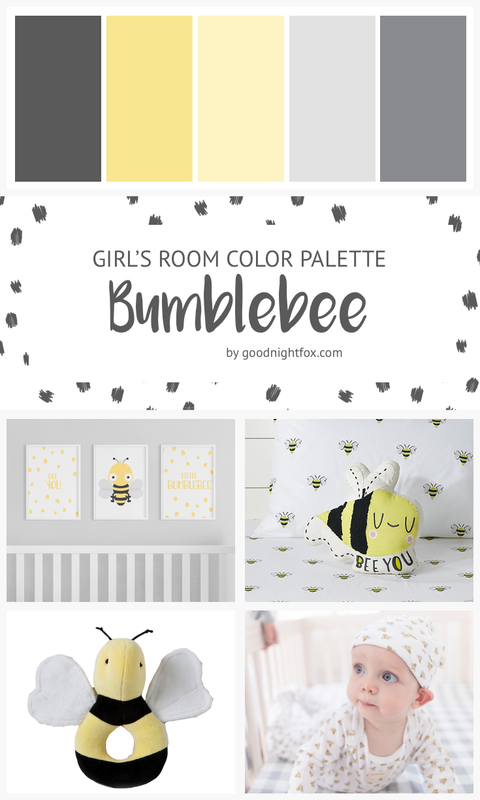 I was so inspired that I started to find adorable little bumble bee bedroom sets everywhere! And I even created this cute "Bee You" poster to match. This bedroom set is perfect for your BEE-autiful baby girl or could even work as a gender neutral kid's room. Sometimes all of the bright vibrant colors, while fun for kids, just don't seem to match the rest of the decor in your house. So how do you get that playful fun look for a kid without looking like your room barfed a rainbow? I love some of these basic neutrals with just a single pastel color to accent the room, like this brown and pink (or coral if you like) girl's room. It's perfect for her sweet little getaway! Looking for the perfect, sweet style for your little girl's room? Look no further than this adorable purple hippo bedroom set. These bright purples paired with neutral bedding like this gorgeous polka dot sheet set make for a beautiful girl's bedroom. This room is perfect for your sweet modern baby! I especially love this collection if you have a baby who's name starts with the letter "K". All of the Kyles, Kevins, Kellys, and Katies will love this room themed after their name. Better yet, teal is perfect for a gender neutral nursery and it goes with just about everything!